Welcome to the third issue of the Yee Fung Toy Global Village Voice, an electronic newsletter for the World Yee community. In this issue we are featuring celebrations of the New Year and annual Spring Banquets from associations around the world. View photos at http://www.flickr.com/photos/tags/yeefungtoy/. We also have a report on observing Ching Ming in Vancouver. Dr. Albert Yee compared Chinese and Jewish experiences in a lecture presented with the help of the Seattle Yee chapter. As I mentioned in this space in our inaugual issue, Albert discovered the Seattle website and introduced himself to us with an email. As an author, retired university dean and professor of cultural psychology, he has much to offer and his presentation is one of his continuing efforts to share his expertise and insights. We have reprinted reports of his lecture. Another Yee Family member that was mentioned in our inaugual issue is Mr. Yee Wah Sing, whose inquiry about the First World Yee Convention I found in an online message board a year ago. We have since exchanged email, and discovered we originate from the same ancestral village district in Hoiping (China) and went to the same high school in Suva, Fiji about a decade apart. He wrote: "My father's name is Yee Chew Loy, from the village of Biu Kong, Wang Kong. He was a farmer at the Chinese Gardens in Lautoka [a town in Fiji] where I was born in 1957. I also attended Marist Brothers High School (last year Form 6- 1975). Four years ago, my family moved to Sydney but I still travel regularly to Fiji where I have business". Wah Sing has been very successful in business, and has presented his thoughts on core values that create wealth in an invited public lecture in Fiji last month. His insights are applicable to every country, whether large or small. Please view the entire lecture. 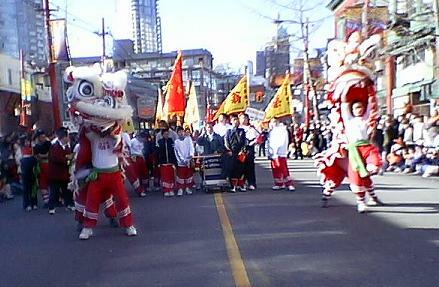 The Vancouver Chinatown New Year Parade was held on a cool but sunny Sunday on February 13, 2005. Our colourful Lion Dance team attracted the attention of a roving CTV (Channel 9) TV crew even before we left our Society House on Georgia Street. They interviewed our lead dancer Hinson before following us to the parade starting point at the Millennium Gate. 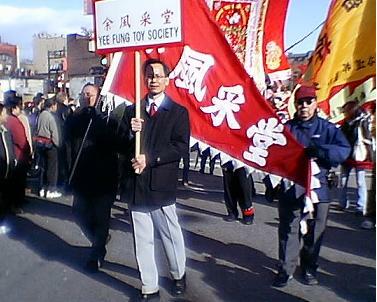 Besides the lion dance team led by Sifu Fan, the Yee Fung Toy of Vancouver parade team consisted of Canada Chairman Mr. Kan Yu, Vancouver Chairman Mr. Jim Yee, several of their Board members and Advisors. For the first time, we also had 4 special guests from the Seattle Yee Family Association join us: Fred Yee and Clara Cheung, and Lan and Tony Ching. The parade started at noon. The parade around Pender Street, Gore Street, Keefer Street, then back to where we started, took more than an hour to complete. We then swung by the offices of a local TV station located in Chinatown, Channel M, for a prearranged interview and lion dance performance that was videotaped for later broadcast. Before returning to the Society House for a well-earned rest and a buffet lunch, our lion dance team turned to the 100-block Keefer Street to perform in front of retail and business storefronts, "devouring" green lettuce and collecting red packets of donations. This year money collected by all participating lion dance teams were donated to the Red Cross Tsunami Relief fund. For a report and pictures from our Seattle guests at the Parade, visit the Seattle webpage. For extensive photo coverage, visit David Wong's webpage, and photos at flickr.com. 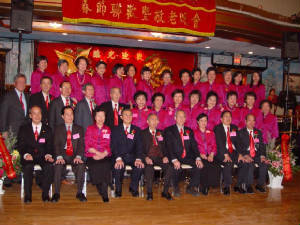 The Yee Fung Toy Society of Canada celebrated its 101st anniversary and the Chinese New Year of the Rooster at its annual Spring Banquet on February 26, 2005. The ancestor ritual started at 1:30 pm in the YFT House on 226 East Georgia Street, Vancouver, B.C. where Chairman Mr. Kan Yu, the YFT advisors, and the Board of directors made offerings to our ancestor Yee Chung-sheung. Mr. Wing Yee emceed the program. Special guests who attended this ceremony included the People's Republic of China Vancouver Consul General Tian Chunyan, Consul Li Shaoching, Vice Consul Wang Chien, and Consul Feng Lin; US YFT Grand Advisor Dr. James Yee, Seattle YFT President Mr. Hing Ng; our cousins from the Mah and Tse Benevolent Associations, and the Fung Toy Alumni Association Chairman Mr. Raymond Lee. After the ritual Mr. Shui Ji Yu read the commemorative remarks. Mr. Kan Yu delivered a welcoming speech that touched on the history of the Society. This was followed by congratulatory speeches from our guests. After the speeches, we all had lunch in the YFT House, we especially enjoyed the delicious home made traditional dim sum provided by members of the Tse Benevolent Association Women’s Committee. Our Spring Banquet started at 6 pm at the Floata Seafood Restaurant. Honoured guests included the PRC Vancouver Consul General Tian Chunyan, MLA Mr. Patrick Wong, US YFT Grand Advisor Dr. James Yee, Seattle YFT President Mr. Hing Ng and Advisor Mr. Fred Yee. Special guests included Judge Bill Yee, Sifu Franky Fan, the Coach for the YFT Women Singers, and our Legal Advisor, Mr. Norman Morrison. Other guests included the Mah and Tse Benevolent Association members, Fung Toy Alumni, and other invited guests from the Chinese Community, and of course, our own YFT members and their families. We had over 450 people attend this happy gathering. The Banquet festivities began with the Lion dance, provided by the YFT youth group. Ms. Michelle Yee and Mr. James Yu emceed the formal evening program. Mr. Kan Yu reviewed the past term (2000-2004) and announced plans for the new term (2005-2008). Greetings from the PRC Vancouver Consul General Tian Chunyan, MLA Mr. Patrick Wong, Minster of Immigration and Multiculturalism and Yee Family Association of Seattle President Mr. Hing Ng. After the introduction of our special guests in attendance, the Chairman introduced members of the new YFT 35th new Board of Directors as the first course of the dinner was served. Following a toast to the New Year and introduction of guests from the Community. Vice Chairman Mr. Jim Yee delivered a Thank You speech. The highlight of his speech was a demonstration of the new World Yee Family Association Web site and other sites such as Canada, US, the Philippines, Vancouver, and Seattle. All these sites have homepages in both Chinese and English. The Canada Chinese homepage was printed and framed, and presented as a memento to Consul General Tian Chunyan by Chairman Kan Yu. Mr. Phillip Yu emceed the entertainment portion of the program. Performances by the Fung Toy Alumni and songs from the Women’s Singers were followed by Karaoke. Mr. Harvey Yee and Mr. Phillip Yu emceed the Vancouver Scholarship Awards to 10 students (3 form Elementary, 3 from Secondary, and 4 from University). Ms. Anne Yu and Mr. Jimmy Yee assisted with the presentations. This year we honored a very special cousin, Lai-Sun Yee, during our banquet. We had a plaque for her and it says, and I try to translate semantically: An Honor of Yee Family. Some of the folks in New York and Boston know her parents already. Lai-Sun is a shining star of our Yee family. She finished law school at Cornell; and she had held different important jobs at NYC Fire Department and NYC Office of Emergency. Recently she became General Counsel for NY SEMO. I think it is very noble to dedicate oneself to public service. We always complain about the government. But let's say "someone has to do it" in order to make life better and put everything in order for the country we live in. Let's give a big hand to Lai-Sun. She is now on our email list. I also had a great opportunity to speak to a bunch of cool guys during the banquet. They all are somewhat related to engineering. These guys are shown on the photo (from left to right): Eddie (Polytechnic), Michelle (Fordham), Kin Hong (MIT), Prof. Kenton (Columbia), and Herbert (Stony Brook) with Andy. They were discussing engineering jobs and what the job market would look like in the near future. These guys are getting or got already a good technical education. I am sure these guys will go far and do great. I am seeing a youth league right there. Somebody already suggested we could hold a "career night", or something. Let's see. Check out our banquet photos. Lai-Sun Yee was honored by Manhattan Borough President at the Lunar New Year Celebration at New York City Hall on Feb 28 (see official press release and a news report in the Chinese media). The Yee Family Foundation held their 105th Anniversary and Spring Banquet in Philippines on February 27, when they also installed a new Board of Directors. View photos and report in Chinese. 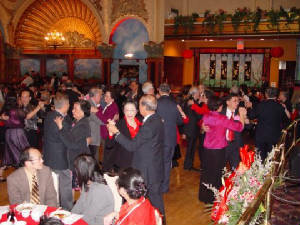 This year's banquet was held at the Empire Garden Restaurant on Saturday, March 5. 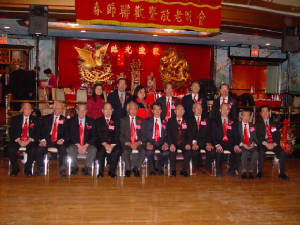 Among the over 600 people in attendance were Grand President , Eastern Div.. Mr. Peter Yee (NY), Presidents of NY Chapter and cousins from the New York Association. The general membership worked overtime in greeting, ushering and performing to help make this a memorable night. At 7 pm the MCs Melinda and Winston announced the program start with 2 songs bearing good wishes for the New Year and some of our members and their spouses dance the swing and foxtrot to their music. After singing, another group of members performed line dancing of a waltz and a Cha-Cha. A New York member performed Tai-Chi. It was truly a very entertaining opening to the Banquet for our guests, friends and relatives. The final segment of the evening included the Association's donations to the Golden Age Center, Kwong Kow Chinese School and Chung Wah Academy. Scholarship monies were awarded to 11 qualifying college students. The closing event was the drawing of the many door prizes. We had another very successful evening. This year we had new member and his spouse to participate to the group singing and dancing. We hope more relatives will join us at the Association and participate in our activities. Your inquiries, comments and suggestions of new activities are also welcome. Please feel free to E-mail them to us. If you were unable to attend the Banquet, you missed a grand time and hope you and your family will be able to attend next year. Check out Banquet photos from our Picture Gallery. World Yee President Damon Yee and his wife Mrs. Angie Yee arrived at Phoenix to attend the annual Yee Fung Toy Spring Banquet on March 5, 2005. He presented a "Great Contribution to the Yee Community" commemorative plaque to Phoenix Chinese Community’s own “Godfather” - Mr. John M. Yee. 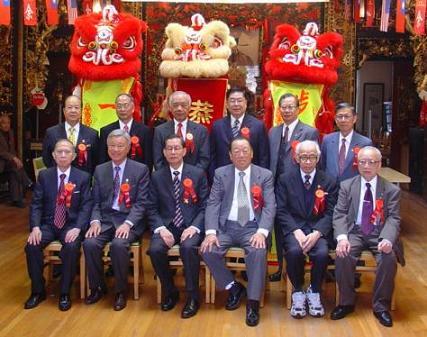 The Phoenix Yee Fung Toy Family Association presented 12 scholarship awards to their outstanding students. 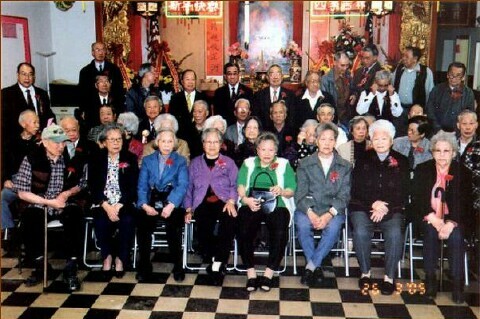 There are only a few Chinese banquets with four hundred or more guests in Phoenix nowadays; Because of its festive atmosphere, the Yee Fung Toy’s annual Spring Banquet is always well attended. In attendance from San Francisco were World Yee President Mr. Damon Yee and his wife, US HQ Western Grand President Mr. Art Yee and his wife, Grand Vice-president Mr. Gene K. Yee and his wife, and Southern California advisor Mr. Alan Yee and his wife. Mr. Damon Yee pointed out that Indonesia applied for and has been accepted as a member of the World Yee Family Association during the second World Yee Convention. Another important event was the renovation of the Yee ancestor shrine - Yee Jing’s Shrine, facilitated by Mr. John M. Yee working closely with the Kaiping Government. Mr. Damon Yee thanked Mr. John M. Yee for his outstanding service to the Yee community. 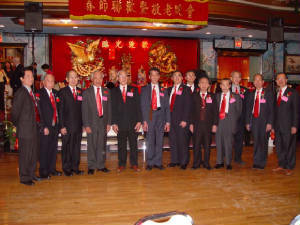 The Yee Fung Toy Family Association headquarters in San Francisco celebrated our annual spring banquet on March 20, 2005 on nice sunny Sunday. Our celebration started at headquarters with our traditional ceremony of honoring our ancestor “Ah Goong” at 12 noon. Afterward, there was a lion dance performance also honoring our ancestor on the fourth floor and the dangerous lion dance stilt walk in front of headquarters. Our luncheon had over 350 people in attendance that provide them with opportunities to meet families and friends throughout the United States and Canada. We had family members from New York, Boston, Detroit, Phoenix, Sacramento, Los Angles, Seattle, Salt Lake City, Stockton, and Canada. The Yee Fung Toy Gala Spring Banquet was celebrated by over 1,200 people with San Francisco’s dignitaries in attendance. California Assemblyman Leland Yee PhD. Speaker pro Tempore, the highest elected Chinese official in California introduced our Mayor Gavin Newsom who presented Certificate of Achievement to Damon Yee, President of the World Yee’s; Peter Yee, Eastern Grand President; Art Yee, Western Grand President and Wesley Yee, President of Yee Fung Toy Family Association HQ. Following the mayor was San Francisco Board of Supervisors President Aaron Peskin, along with former Assemblyman Lou Papan who said he has attended four Yee’s spring banquets. We also had in attendances, California Board of Equalization, District One member Betty Yee and District Attorney Kamala Harris’s representative Sean Do. We were treated to the Yee Fung Toy’s musical group performing for the first time, singing in unison and dressed in wonderful outfits. The group was led by our English secretary Gene Yee who spent countless hours rehearsing the group. Karaoke sing was excellent and everyone had a great time. San Francisco Yee Fung Toy Family Association HQs would like to thank our cousins Ma’s and Der’s, all the community leaders, volunteers, attendees, distinguish guests, families and friends for coming to our annual spring banquet. In the Year of the Rooster, we wish everyone a happy, healthy, prosperous, and peaceful year. See everyone next year! A banquet was held at Rice Bowl Restaurant for this event. Over 400 people attended and enjoyed another wonderful multi-course dinner, the Confucius School Children’s singing and dancing performance and Karaoke. Lucky money was presented to the association’s elders. Members from the Yee Fung Toy Regional Headquarters in San Francisco, Yee family members from Stockton, and members from the Ma Family Association also attended. Earlier in the day, the association paid respect to the ancestors with 6 roast pigs. The Yue's Clansman Association held their Spring Banquet in Hong Kong on April 2, when they also installed a new Board of Directors, and presented scholarship awards. 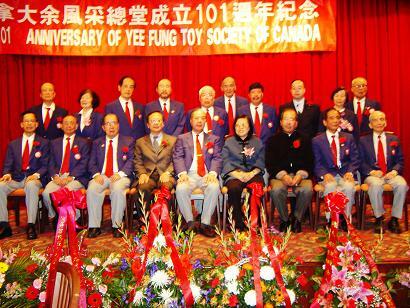 The Yee Fung Toy Society of Edmonton held their Spring Banquet on May 1. Ching Ming is a Festival day on the Chinese lunar calendar that occurs near Easter. Also known as "Spring Remembrance" or "Grave Sweeping Day", it is the day of fondly remembering past family members. This Chinese tradition is formalized into a ritual of offering wine and cooked meat, fruits, paper money, incense and candles to ancestors. On this Ching Ming ("clear and bright") day Chinese people would pay homage and respect to their family members' graves, and clear away the weeds that have grown up since their last visit. The Ching Ming rain pelts helter-skelter. A shepherd boy points to distant Xinghua. After the ritual was over, we headed to the Society house where we all enjoyed the BBQ pork and other goodies for lunch. Participating families also took home BBQ pork portions, as per Chinese customs. Albert H. Yee builds bridges. While they are not the typical ones made of steel girders or rivets, his cross-cultural bridges do more than span great distances. More than 40 people gathered at the Wing Luke Asian Museum on Mar. 22 for his lecture, "Wonton and Kreplach: Comparing the Chinese and Jewish Experiences." China rewarded the now retired psychology professor from Missoula, Mont., with a rare visa in 1972. Chinese officials recognized his work in improving U.S.-China relations; he successfully helped the White House plan President Nixon’s historic visit. As a Stanford University student, Yee noticed many of his professors were Jewish. Their presence would change his life. “I had a lasting desire to learn more about them,” Yee recalls. In 2001, he and Rabbi Anson Laytner, executive director of the Seattle chapter of the American Jewish Committee, published a study on Chinese and Jewish characteristics. 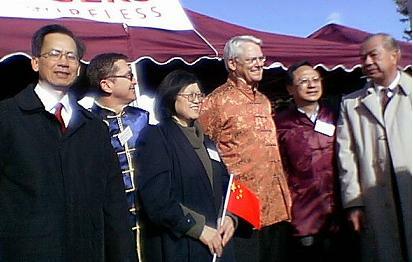 Both currently serve on the Board of Directors of The Sino-Judaic Institute in Menlo Park Ca. (Sino means Chinese). They explored both similarities and differences between the two groups in their study. Yee spoke in detail, discussing seven “factors” (Messianic impulse, family values, the role of women, educational values, the drive to learn and achieve, defensiveness and retribution, and inherited characteristics). Of all the factors, educational values are the most prized. "The core value of both (groups) is the scholar, the learned person," Yee emphasized. He characterized Sino-Judaic relations as being positive and long. "Their history is inspirational and a credit to both sides," commented Yee. "The Jews wrote positively of their experiences with the Chinese." The Chinese, in turn, developed a deep admiration of their newest immigrants. Several hundred Jewish settlers made up the second wave of immigrants in the 1930s, mostly in Shanghai. Yee focused on an important figure in Sino-Judaic history - Feng Shan Ho. While serving as China’s consul general in Vienna during World War II, Ho saved countless Jews from the holocaust. From 1938 to 1940, Ho issued thousands of visas for them to leave Nazi-occupied Austria for the safe refuge of China. "His humaneness went unrecorded," acknowledged Yee. Ho died at age 96 on Sep. 28,1997. "Ho said, 'I thought it only natural to feel compassion and want to help. From the standpoint of humanity, that is the way it should be.'" Yee added. "The Jews asked for visas, and his staff would say, 'How many do you want?'" Sino-Judaic relations blossomed as many Jews remained in China, sought out Chinese citizenship and even became local heroes. To the south, there is a 3,000-strong Jewish Hong Kong community. Many other Jewish citizens reside in nearby Singapore. "Both (communities) can learn so much from each other," said Yee. Fred Yee (no relation to Albert H. Yee), born and raised in Hong Kong, is the vice president of the Seattle chapter of Organization of Chinese Americans. He said about the speech, "I think it’s a good event to kick off a possible future dialogue on various aspects of life for Chinese Americans and the Jewish community here." Rabbi Laytner agrees: "We hope tonight’s gathering will lead to further discussions. There are lots of issues worth exploring together." Albert H. Yee authored 11 books. His latest book, Yeee-Hah! : Remembrance and Longing, covers his study of the two groups, but he points out it's more about his own life experiences, both its highlights and challenges. For more information on Dr. Yee, view a short bio [PDF]. Address by Yee Wah Sing, Managing Director Marco Polo Holdings Ltd- developers of Garden City, Suva, Fiji. ... I begin my talk by assuming that we all espouse some common principles: that mankind is one, that our society is moving towards greater inter-dependence and that we must work together to eliminate extremes of wealth and poverty. In a multicultural country such as Fiji, the battle to reduce poverty isn’t just about tinkering with the economic mechanism but also about promoting greater social cohesion and human dignity in our community. The creative energies of every citizen must have a suitable channel through they can be expressed through meaningful work, both as a means of livelihood for the individual and as a way of contributing to the development of our nation. I have been invited here to share my personal experience of “winning against poverty”. I am not here to give you a rags to riches story, or how to become a millionaire in a few years. 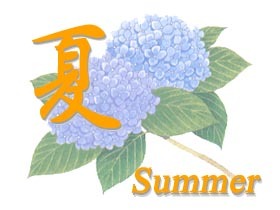 The next issue of the Yee Fung Toy Global Village Voice will be published in mid September of 2005, featuring summer picnics and the outdoors at Yee Fung Toy associations and other activities around the world. Please submit your articles to the Editor via email (editor @ yeefungtoy.org) or postal mail (The Editor, 226 East Georgia Street, Vancouver, B.C., Canada V6A 1Z7) by August 15, 2005.